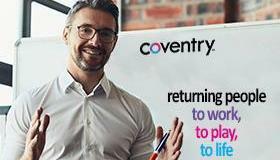 Coventry's products and services assist workers' compensation professionals in adapting to ever changing industry needs. Adjusters are often faced with a case that just doesn’t seem right. It could be concern over compensability, causality, excessive treatment or maybe it is time to move towards a settlement. In such cases, the benefit of a medical legal expert can prove helpful. Whether you need a medical record review, file assessment, identification of medical experts, or support for mediations and depositions, the expertise of a specially trained nurse can assist with better understanding the case specifics from a different vantage point. Legal Nurse Review utilizes Coventry’s distinctive expertise through medical legal professionals who adhere to the highest standards of legal, business, professional, & ethical conduct. 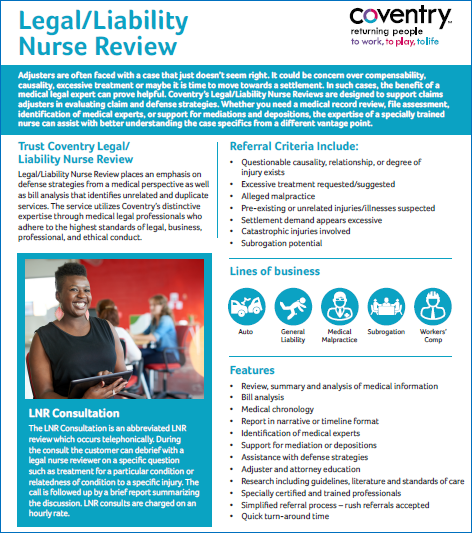 ﻿﻿To learn more about Coventry's Legal Nurse Review download our fact sheet.